Oklahoma Sam, a 4-year-old American Mammoth Jackstock, is named 'World’s Tallest Living Donkey’ according to Guinness World Records. She stands at 15.3 hands, she dwarfs the common donkey, which stands at about 8 hands, and her own larger Mammoth Jackstock breed, at around 12 hands high. The four-year-old record-breaker lives in Watsonville, California, USA, where she shares her one acre of land with a Macaw, duck, goose and four cats. Sam's overall care is handled by 54-year-old Linda Davis, a keen gardener and animal lover. 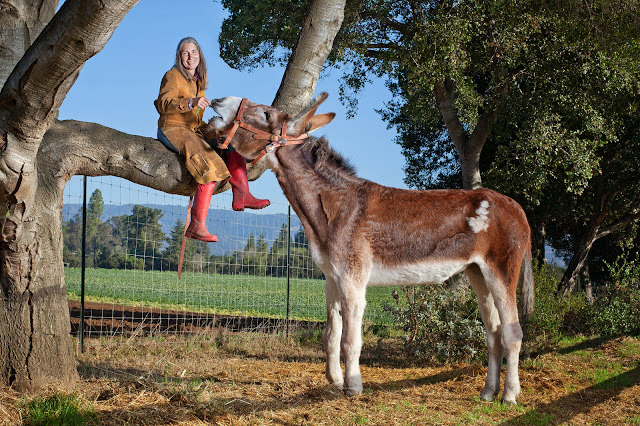 Linda, who calls Sam her "soul mate", says that "It actually doesn’t cost any more to have a donkey of this size. She doesn’t eat more. In fact, if I give her more bale she’ll just use it to make her bedding more comfortable. She loves her sleep."